This post will walk you through the steps to deploy your gradle project to the Sonatype OSS staging repository. Apply the maven and signing plugins. The signing plugin will sign your jar and pom files, which is required for deployment to the Sonatype OSS repository. Configure the signing task by specifying which artifacts to sign, in this case all the artifacts in the archives configuration. This will not yet include the pom file, which will be signed later. Then we need to configure the generated pom file, sign the pom file and configure the Sonatype OSS staging repository. The 'beforeDeployment' line will sign the pom file right before the artifacts are deployed to the Sonatype OSS repository. The 'repository' part configures the Sonatype OSS staging repository. Notice the sonatypeUsername and sonatypePassword variables, these are property variables to which I'll come back to later in this post. The 'pom.project' section configures the generated pom files, you need to specify all this information because it's required for the Sonatype repository (and Maven Central). That's it for the configuration of your build script. This will generate a key that will be stored on your computer and on sks-keyservers.net. Remember the password because there is no way to reset or restore it when you forget it. That's it for the initial setup. 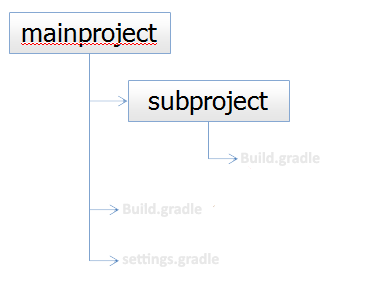 Once you've done all the previous steps in this post you can deploy your project with just one single command: "gradle uploadArchives"
Gradle build script are written in Groovy, which allows you to define every step of the build process. Now, as a Flex developer the first thing I wanted to try out was to build a swc file. I tried to incorporate some multi-project structure into it. The build.gradle file of the subproject contains a compile task (don't mistake this with the 'compile' configuration which I declared in the mainproject's build file). This task can be executed by calling the "gradle compile" command from a command line and it will build the swc file. Gradle has some awesome support for Ant tasks (maybe even better then using them in Ant itself). As you can see I'm using the java Ant task to execute the compc compiler, and I'm providing it some ant property names which I can use after the ant task has been finished. Gradle takes some getting used to (certainly if you've never used Groovy before), but it's totally worth the effort. I'm going to investigate further into this and see how it scales to bigger projects. © 2011 Yennick Trevels • All Rights Reserved.. Picture Window theme. Powered by Blogger.